Shabby chic – soft and opulent with signs of age. That’s what I think of when I look at this card I made for Mommy. Layer paper, fabric, cheese cloth, and tissue paper. Sew a button in the middle of the stacked layers then spray with heavy-duty spray starch till soaking wet. Scrunch and shape then let the flower dry. The drying takes a few days because of all the layers. 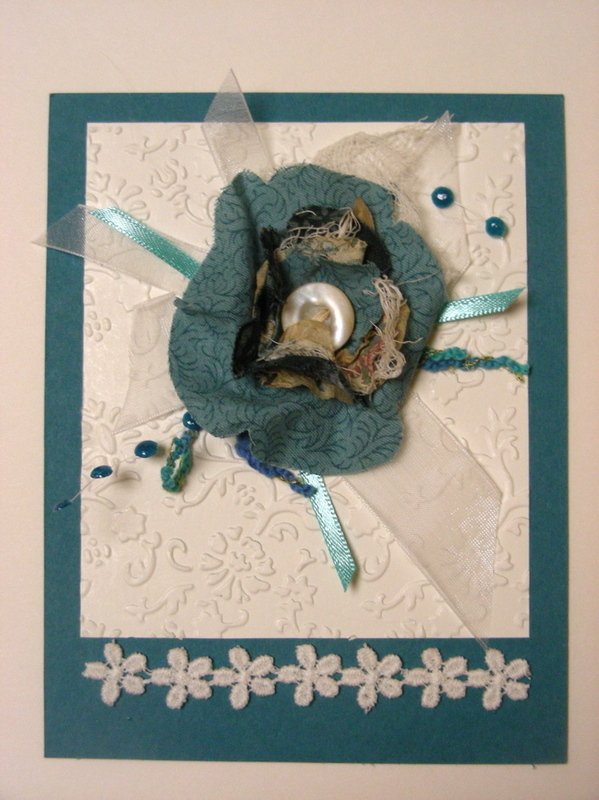 Then attach to a card front with Glubers. Raid your fabric and ribbon stash and have fun creating one. 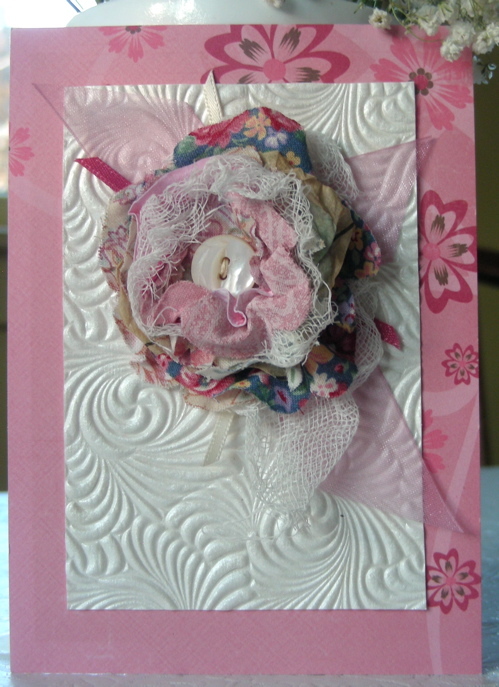 Posted in Anita K Greene, Author, Flowers, Paper craft and tagged flower card, Glubers, shabby chic. Bookmark the permalink. Yesterday we had record breaking warm weather. The thermometer reached into the high fifties! – any snow makes us happy! 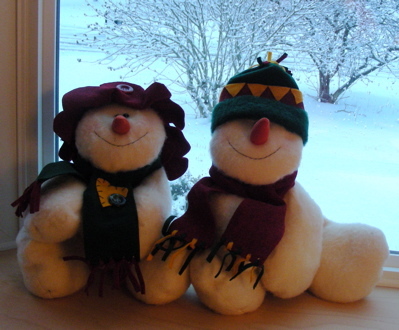 Posted in Anita K Greene, Author and tagged snowfolk, Snowman, wimpy winter. Bookmark the permalink. The desire to organize seems to hit me every year in the month of February. Perhaps it’s because I spend more time indoors during the cold months (though that is a bit of a misnomer for this particular snowless winter with its 50 degree weather). Last weekend, I defrosted the basement freezer. The only surprise there was all the room I had once the frost melted. This weekend, I tackled the long neglected spice cupboard. I tossed a bunch of expired herb and spice mixes. When was the last time I made spinach dip for pete’s sake? We don’t do dip. Not even during the holidays. I think I bought them for my fantasy life where I entertain – a lot – and serve dip. Then there was the fish seasoning I bought in an open air market on the island of St. Martin. You know how the person who isn’t crazy about fish to begin with is usually the one who ends up finding bones in the ‘boneless fillet’? In my house, that would be Old Roady. So I rarely serve fish. That wonderful blend of spices, now several years old, ended up in the trash – another victim of my fantasy life where Omega 3 is an integral part of our diet. I was pleased with myself for all the purging and cleaning until I read Sara Noel’s Frugal Living column in my local paper and this statement sent me running back to my cupboard: McCormick’s website states that if their spices are in a tin can, they are at least 15 years old. Okay, so mine is Durkee brand. Can I fool myself into thinking it’s NOT 15 years old? I tried to decode the expiration date using Durkee’s FAQ page, but the number and letter sequence doesn’t make sense. Add that lack of information to the price tag still glued to the bottom – $1.67 – and I’m thinking I could have tossed this can of paprika 14 years ago and never missed it. Now I’m in a quandary – throw out the can or keep it. I found the same one pictured on ebay labeled ‘vintage’. It’s a collectible. A few more years and it will be positively antique. This red tin can would look lovely in my fantasy Country Living kitchen. 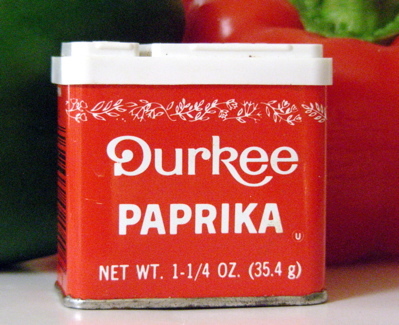 Posted in Anita K Greene, Author, Food and tagged antique, cleaning, Cupboard, Durkee, Fantasy, Food, McCormick, McCormick & Company, Paprika, Seasonings, shelf life, Spice, Spice mix, vintage. Bookmark the permalink. I love these! Could it be because I got to play with my stash of fabric and vintage buttons? Layers include fabric, printed paper, tissue paper from an old pattern and cheese cloth. Cut small, medium and large flowers and circles (I used Sizzix dies – Flower Layers and Circles #2 – but cutting shapes free hand would work just as well.) then stack with the largest on the bottom and smallest on the top. Add a bit of cheese cloth at the bottom and between one of the layers. Sew a button in the center to hold the stack together and soak with spray starch. Pinch and scrunch to shape the flower, then let dry overnight. Center a 2′ Glubers on the embossed background (Cuttlebug’s Textile folder). Add bits of ribbon, yarn, lace and beads around the edge of the Gluber. Then press the flower into the center. 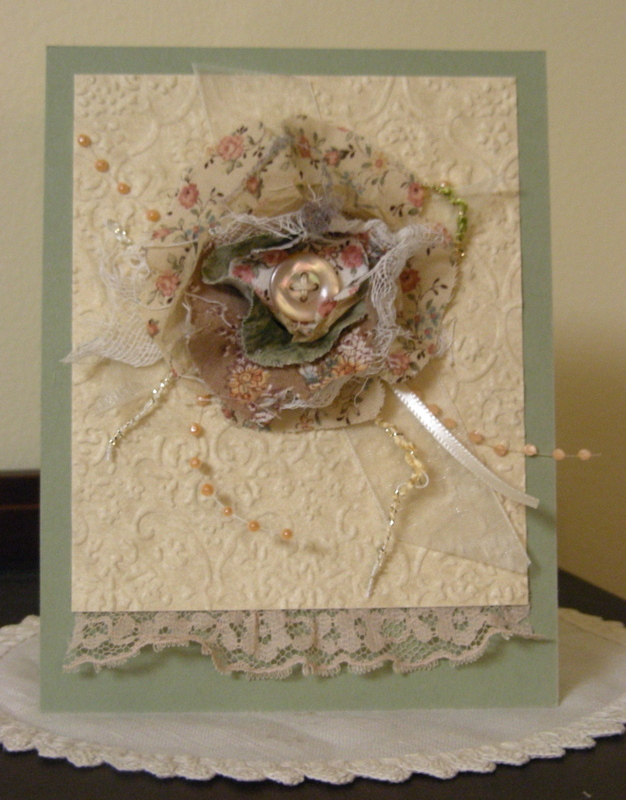 Posted in Anita K Greene, Author, Fiber Art, Paper craft, Writer and tagged Circles #2, Flower, Flower Layers, Glubers, Mixed Media, Paper, Sizzix, Spray Starch, Textile, Tissue paper, Vintage buttons. Bookmark the permalink. Went through my stash of old cards and found this bit of artwork to up-cycle on a Valentine card for Old Roady. I didn’t want fru-fru pink hearts or lace so stuck with browns and a muted maroon. 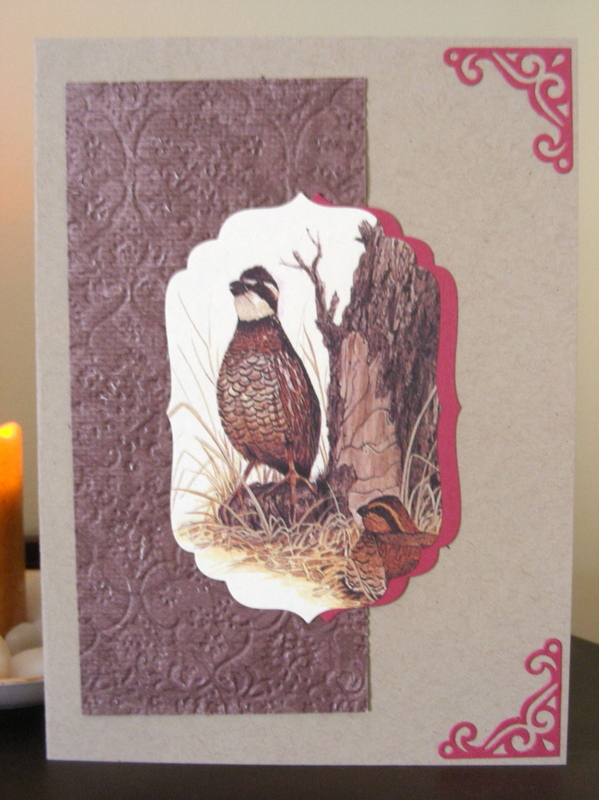 I used a Cuttlebug die for the corners and Spellbinders Label Four die (S4-190) for the artwork. This next card is more traditional. Screaming Valentine’s Day! The red glitter paper is from Stampin’ Up. (I think it was introduced in the Holiday mini catalog.) I cut out the hearts with my Sizzix dies. The smallest heart is stamped with a PSX stamp. (I understand they are no longer in business and the secondary market has some outrageous prices for their rare, collectible designs.) I stamped the image with VersaMark clear ink and embossed with red embossing powder. MS punch along the bottom is Doily Lace. The embossed background is done with the Craft Concepts Cottage Floral embossing folder. 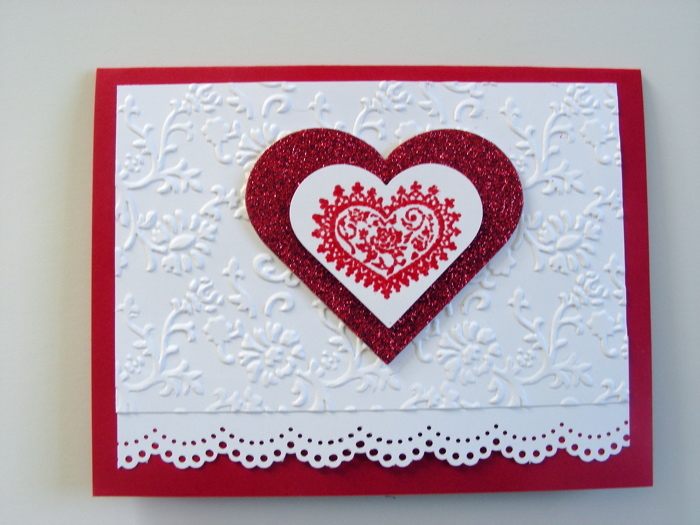 Posted in Anita K Greene, Author, Paper craft, Writer and tagged Cottage Floral, Craft Concepts, embossing powder, Glitter paper, Happy Valentine's Day, Labels Four, Personal Stamp Exchange, PSX, Sizzix die, Spellbinder, Stampin' Up, Versa Mark, Versamark. Bookmark the permalink. February 10th ~ Umbrella Day! 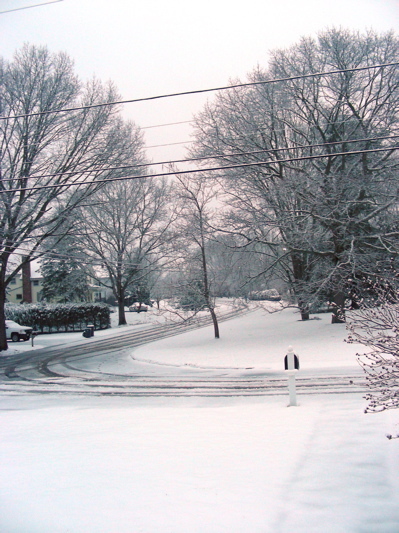 In this practically snow-less winter, a light dusting that would have been poo-poohed in the past is exciting to see. This morning, we woke to about a half an inch on the grass and deck. I’m sharing a Zentangle tile I created a few weeks ago. I was waiting for a snowy day to share. Considering the winter we’re having – this may be it! My title for this tile is ‘Snowday’. 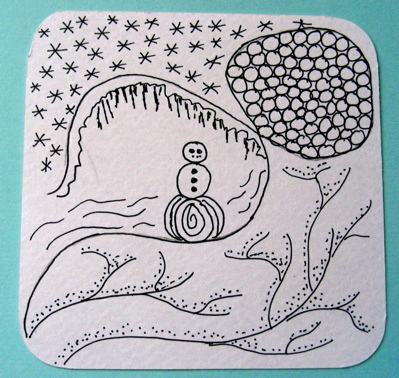 Posted in Anita K Greene, Author, Writer, Zentangle and tagged Snow day, Snowday, Snowman, Zentangle. Bookmark the permalink.